a thorough analysis of the game, about this time tomorrow. Yesterday we played Fontenoy. Greg took the Austrians and the Dutch, MacTakis was the leader of the British-Hanoverian contingent and Miltiades and I played with the French. Miltiades sent me a good number of excellent pics and I spent some time to insert them between mine. You can follow the story by pressing the Toggle Slideshow button upper right corner. The Austrians and one Dutch infantry brigade moved forward and soon all units defending the line between Fontenoy and Antoing were engaged in firefight. The first Dutch attack against Montagne's brigade (Swiss and dismounted dragoons) failed, but soon, the second wave of Dutch infantry managed to eliminate a regiment of dismounted dragoons and opened a gap between Fontenoy and the redoubt defended by Diesbach Swiss regiment and one gun battery. Miltiades rushed forward La Maison du Roi Cavalry brigade to stop the intruders, but after receiving some musketry they retreated in a safe distance keeping the Dutch at check. Meanwhile, MacTakis approached Fontenoy With Ligonier's brigade and soon Fontenoy was attacked from two sides, one by the British and one by Greg's Austrians-Dutch. The first British battalion to attack Fontenoy had a very bad luck, receiving 5 hits outright, but Takis and Greg continued the attack, eliminating one of the French battalions defending Fontenoy and sending the other to retreat. Other attacks of the Dutch infantry had not better chance, as Diesbach veteran battalion was defending well, aided by enfilading fire from the French Heavy Gun Battery stationed at the other side of the Scheldt. The rest of the British-Hanoverians were not so active, as Ingoldby's brigade dithered two or three times. Takis unlimbered his guns and gave a few hits to the Gardes Francaises who retreated out of canister range, but having always an eye to move for the recapture of Fontenoy. Meanwhile, a single Dutch battalion made a rash move to approach the second French battalion that previously defended Fontenoy which was reforming and exterminate it with flank fire. It soon took punishment and was done for, as it received fire from the Gardes Francaies and Diesbach which turned to fire abandoning the redoubt. Diesbach was receiving rear support from La Marck brigade which shifted forward from Antoing which was not threatened for the time. MacTakis made an opening between his infantry brigades to move the Superior British Cavalry forward. He also dispatched Ingoldby's superior Highlanders, who entered the Barry Woods, and after three turns firefight with the inferior (according to the scenario) Arquebusiers de Grassin, annihilated them and were masters of the woods, threatening to exit at the flank of the redoubt d'Eu. The d'Eu redoubt was cannonading the approaching Hanoverians, having mainly in target one battery, but never managing to bring it to exhaustion, as Takis' battery managed to lift one hit at the end of each round. Diesbach was making an heroic defense to hold the line between Fontenoy and Antoing, received and repulsed many charges from Austrian and Dutch cavalry and finally succumbed. The French lost also one battalion from La Marck brigade, but this was the higher point of the Austrian and Dutch attacks, as their infantry and cavalry was at the point of exhaustion. 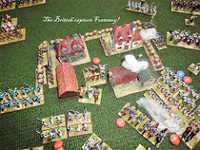 The Austrians lost a large cavalry regiment against Diesbach and the Dutch lost one cavalry regiment against the dismounted dragoons and the two other Dutch cavalry regiments retreated away from the fight to reform. To the repulse of the Dutch cavalry helped the enfilading fire of the infantry guarding Antoing and form the French artillery across the Scheldt. All this time Fontenoy was remaining in British hands. The British cavalry gallantly attacked d'Estrees' infantry brigade but they soon retreated to reform. D'Estrees lost one battalion from the musketry of a large Hessian regiment approaching, but the French line was holding. One of the Gardes Francaises battalions was done for while trying to attack Fontenoy, receiving fire from both the Fontenoy defenders and enfilading canister fire from a British battery. Meanwhile, Miltiades was trying to slip the Irish Brigade between d'Estrees and the Gardes Francaises, while I moved Hérouville's Cavalerie Legere in columns past Antoing to try to envelop the Dutch cavalry reforming and the depleted Dutch infantry (having just recovered from reforming). Takis moved the Hanoverian cavalry in columns trying to outflank the French moving through the Bois de Barry, but this move was too slow, as we decided to call it a day. The British managed to hold Fontenoy. The French lines between Antoing and Fontenoy and Fontenoy and Redoubt d'Eu-Barry Woods were holding. A 10-7,5 winning draw for the Allies and a really, really enjoyable game! Great Report. Nice to see that you finally managed to play this battle which is'nt easy. Thank you! Your scenario was very inspiring and we had a great time! It was a big battle and we stopped it after 7 rounds, I think that if the French did not attempt to make an aggressive move they could hold their lines. I'd like to note though, that if Fontenoy is pressed from two sides it can resist for 2-3 rounds and then it will fall. It will be very difficult to be retaken then. Takis sent the Highlanders in the woods and the Arquebusiers de Grassin had no chance confronting them. It was a spectacular battle, with successive battle lines very close and the cavalries were striving to find open ground to take part in the fight, especially the French. In our battle, strangely, no French cavalry was lost. Antoing is a very strong position to be taken, I gave to the 10-7,5 score for the Allies 1 point for holding Fontenoy. Greg and Takis did a great job with the Allies. Maybe Miltiades and I could fare a little better with the French. I feel very satisfied that we managed to play Fontenoy, it is one of my most beloved battles! All the guys expressed their enthusiasm and I greatly thank them for having participated! I plan our next big battle to be Schellenberg. Nice to read that you all enjoyed the battle. I thought so too, that it is very difficult to defend Fontenoy. Reason is, that even with Dithering Dutch commanders you have at least a small chance to assault the village in time. During the real battle the assaults were not really coordinated. If I would make it for the Dutch more difficult to move - it would be boring for the player who get the Dutch army. Had Richelieu's troops any impact on the battle at all? I think that it is'nt too surprising if you don't loose French horse. To use them like the French did in 1745 make no sense to a wargamer. I can remember that my wife lost most of her French cavalry when we played the small version because she used the cavalry to fill the gaps. It's difficult to move the cavalry in battle because there is little space to deploy them properly. With elementary Allied coordination it is a matter of time for Fontenoy to be lost. Dutch and Austrian troops started two moves away from the defenders, so it wouldn't be too difficult to reach them. And Greg's infantry did not dither at all only the Dutch cavalry a couple of times. After having taken losses, it also brought a 1 and had to retreat one further move backwards. In our Volley and Bayonet Fontenoy game all the French cavalry undertook a very decisive role, killing or chasing away all Allied units having intruded the Antoing-Fontenoy-d'Eu perimeter. I don't remember if I had lost a couple of cavalry regiments then, but they had ample space to operate, as a great number of French infantry was lost or had retreated. In this battle the French cavalry was used to fill the gaps, but it did not attack. Miltiades and I decided to deploy Richelieu's troops behind d'Eu and d'Estrees who had lost its leftmost battalion from Hanoverian shooting. A gap was opened between d'Estrees and the troops defending d'Eu, but the redoubt would hold. This cavalry and the Light Cavalry unit stayed as a mobile reserve to watch what Takis would do with his Hanoverian cavalry who attempted to pass them through the Barry Woods, but this would be a very slow move and the game ended. There was really little space for the French cavalry to be deployed properly, but I think it was very realistic. The whole battle gave me the feeling that we managed to refight a proper Fontenoy! Troops defending a city and deprived from the ability to remove hits, if pressed continuously, sooner or later they will be eliminated or forced to abandon it. The point is to keep fresh reinforcements ready to intervene and retake it. So, deploying superior troops in a city will be some way to prolong their stay, but if the pressure is not relieved, they will also succumb and you will have lost your best troops. I hope to do it next year on the 275th anniversary. These days I'm painting Semphills highlanders. If I remember it right I tried to pull back the Arquebusiers de Grassin in our game. As dindin wrote it, it's crucial not to use crack-troops for the defence of Fontenoy but to pull them back and occupy the village again with fresh troops. That is, what de Saxe did. To replace weakened troops is a masterpiece for us armchair generals indeed. I hope to do it nex year on the 275th anniversary. This is good news! More units=bigger and more exciting battles! Cheers! Hats off to Obscure Battles blogspot!